Physical therapy is a skilled treatment that helps individuals restore function, gain relief from pain, promote independent living, and understand how to prevent re-injury. Physical therapy assists people in recovering and adapting to conditions that limit their ability to move and perform functional activities in their daily lives. Customized treatment programs to improve one's ability to perform functional activities of living. Ergonomic assessment to determine if your work set-up is appropriate and safe for your body. Evaluation and treatment of injuries or medical conditions that limit one's ability to move about independently. Pre-employment and athletic screenings to assist in noting areas of weakness or injury prior to beginning a job or starting sports. Deconditioning due to an illness or injury. Weakness and limited range of motion due to injuries or surgery. Dizziness related to: BPPV, Meniere's. Chronic conditions such as arthritis, back and neck pain, and over-use injuries. Traumatic brain injury, stroke, and spinal cord injuries. Children with developmental delays or with cerebal palsy, torticollis, spina bifida, and other developmental conditions. Athletes with injuries or who have had recent surgeries. Physical therapists (PTs) are health care professionals who diagnose and treat people who have medical problems or other health-related conditions that limit their ability to move and perform functional activities in their daily lives. Physical therapists assistants (PTAs) provide physical therapy services under the direction and supervision of a physical therapist. PTAs must complete a 2-year associate's degree and are licensed in the state of Wisconsin. Customized treatment programs to improve one's ability to perform daily activities. Adaptive equipment recommendations and usage training. Comprehensive physical performance testing to ensure safe and appropriate completion of work tasks. Formal assessment and treatment of upper extremity injuries. Fabrication of custom upper extremity splints. Guidance to family members and caregivers. Speech and language pathology is available for treatment of speech and language problems. Swallowing evaluations are also done when it is uncertain if a patient can safely chew and swallow. Treatment is conducted for articulation, stuttering, voice disorders, delayed speech and aphasia, and the partial or total loss of the ability to speak or understand language. 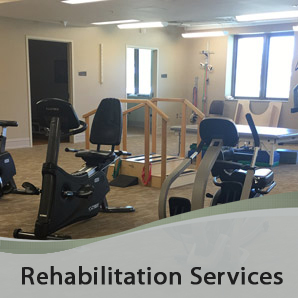 Cardiac rehabilitation is a medically supervised program consisting of exercise training, education on heart healthy living, counseling to reduce stress, and helping patients return to an active lifestyle and recover more quickly. 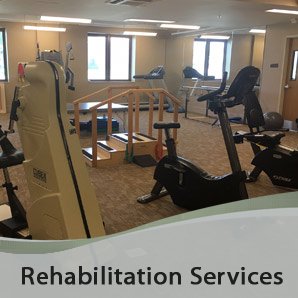 Cardiac rehab offers a multifaceted and highly individualized approach to optimize the overall physical, mental, and social functioning of people with heart-related problems.